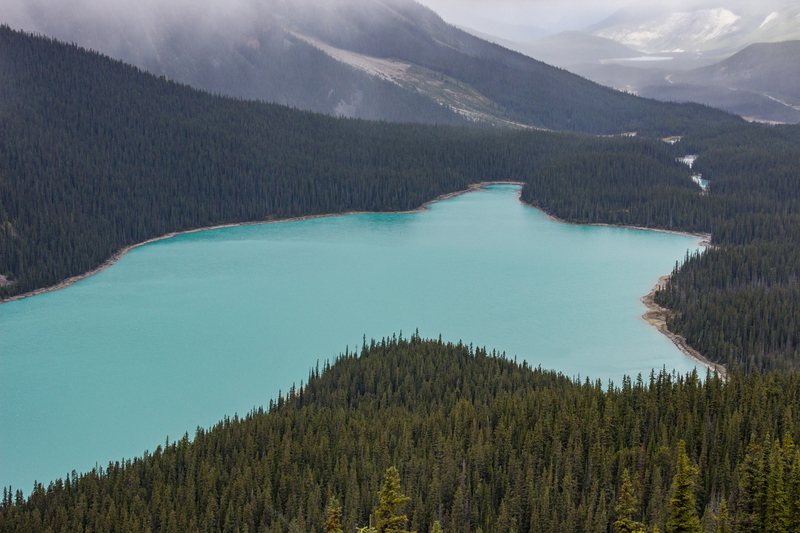 Peyto Lake is easily one of the most photographed lakes in Canada and it's easy to see why; it's shaped a little like a wolf, is a beautiful milky blue colour, and is right off the Icefields Parkway. Because of all the reasons above, it was high on our list of places to visit and was one of the first (if not the first) stop we made on the Icefields Parkway from Banff to Jasper. 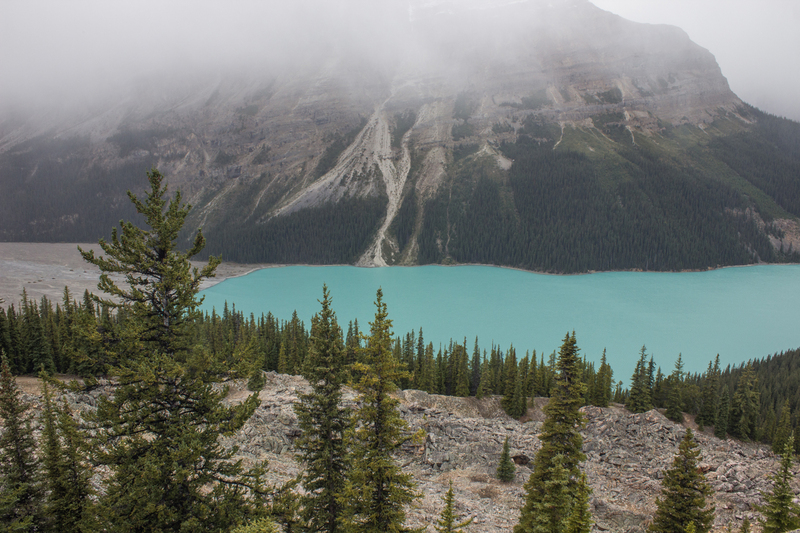 It probably takes about 10 to 15 minutes to walk from the car to the first lookout over Peyto Lake, depending on how fit you are because boy it is a steep hill. I was incredibly unfit and Daz would not give me a piggyback. The panting, groaning and pain is worth it to see Peyto Lake with your own eyes and try to fathom that colour, and get a few photos that will probably be an instant Instagram hit (unless you got hit by the sucky new algorithm, yes, I'm bitter) because who doesn't love a lake the colour of the Night King's eyes? While we were stood here it started to snow and a blanket of cloud descended on us. We had planned to keep walking up the trail to Bow Summit Lookout but wussed out because of the snow. If you decide to do that trail it's a 6km return hike, so it's easily doable in a morning or afternoon. 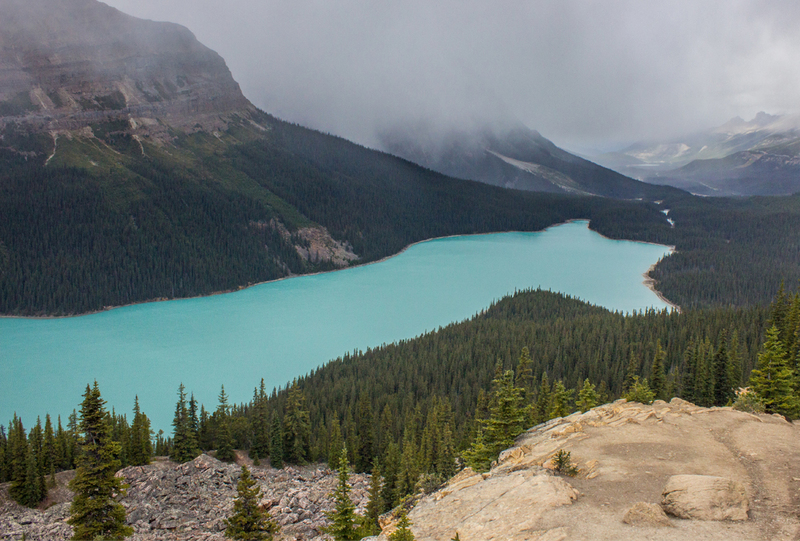 Peyto Lake and Bow Summit are high up our list for our return trip this summer and we're hoping not to experience snow in June, but who knows?